Serving the Omaha area, Audi Omaha, located at 17340 Burt St in Omaha, NE, is your premier retailer of new and used Audi vehicles. Our dedicated sales staff and top-trained technicians are here to make your auto shopping experience fun, easy and financially advantageous. Please utilize our various online resources and allow our excellent network of people to put you in your ideal car, truck or SUV today! For those who crave a car that offers more, treat yourself to the ultimate luxury experience when you visit our award-winning Audi dealership in Omaha, NE. At Audi Omaha, we strive to provide customers with an exceptional experience, from our Audi sales team that will help you find a new or Pre-Owned Audi, to our finance, service and parts teams. 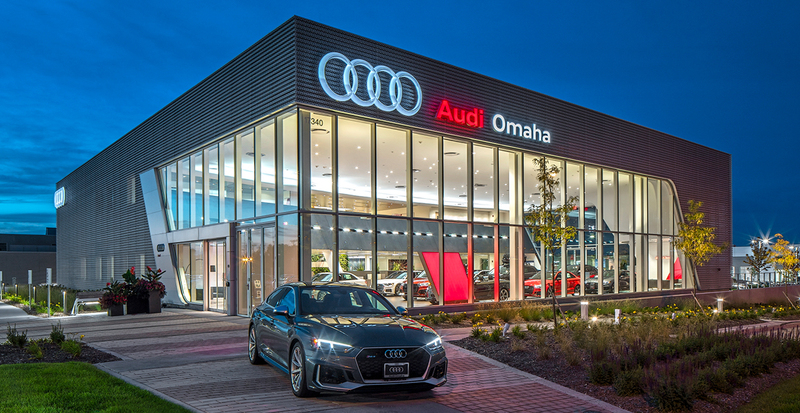 We excel at delivering first-rate customer service in all facets of our dealership, which is why Audi Omaha was honored as a Magna Society Award recipient. By working together seamlessly to ensure every customer is satisfied, we have received the highest honor from Audi. If you're coming in to buy or lease a new Audi, know that we have a wide-ranging selection for you. Experience your everyday drives around Omaha and beyond in a sleek new Audi A4 sedan or a brand-new Audi A3 and enjoy cutting-edge technologies and potent power. Looking for a more spacious interior? Test-drive a new Audi Q5 SUV and see all that it has to offer with its lavish standard features, exceptional performance specs and state-of-the-art driver-assistive perks. If you desire top-notch command on the roadways, know that many Audi models come with quattro® all-wheel drive standard, or offer it as an available perk. We have plenty Certified Pre-Owned Audi models on our lot, too, if you're looking for a high-quality Pre-Owned Audi. And thanks to our excellent Audi service and parts departments, we can help keep your car running for years to come. Enjoy luxury redefined when you shop at Audi Omaha. Our new state-of-the-art Audi dealership located at 17340 Burt St. in Omaha, NE, boasts a modern repair center with larger service bays and innovative technology to help make sure you're in and out in no time! Plus, we'll provide a complimentary carwash for any service appointment you make to help keep your Audi looking its best. At Audi Omaha, we want to make car-buying or -servicing easy for you. That's why we offer a concierge service that will drive up to 80 miles to pick up and drop off cars for our customers! Take advantage of our expanded service loaner fleet while your car is in the shop. Or, stick around and make the most of our large and comfortable customer lounge that features a barista-hosted coffee bar. We're open Monday-through-Thursday from 9:00 a.m. to 8:00 p.m., and although we close at 6:00 p.m. on Fridays, our expanded hours on Saturday can help work around your on-the go schedule. We do not have Sunday hours, however, feel free to contact Audi Omaha with any questions! We're conveniently located so that drivers from Greater Omaha, La Vista and beyond can get to us easily. No matter where you're coming from, our Omaha Audi dealership is just a short drive away. Get directions to Audi Omaha. If you're looking to buy a new or Pre-Owned Audi, or want to schedule Audi service, turn to the experts at Audi Omaha. We look forward to seeing you on our lot!